How have you been? Here the weather is really muggy and I am sweating right now. A typhoon is heading to us and that’s why. Tomorrow the typhoon will change the high-pressure system around the Korean peninsula . I am glad that no typhoon will hit us. Well, today I want to write about our education, especially I want to focus on cleaning up after school. It might not be popular around the world. 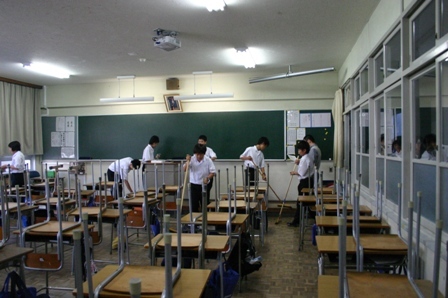 In Japan, from elementary to high school, it is the students’ job to stay after school to clean up our classrooms, hallways, toilets, music rooms, science labs or whatever and school grounds. We don’t have any janitors for our schools. We have to clean up our rooms every single day. We also sometimes have to clean up specific rooms like PE gyms or we wash windows before we have school breaks. While cleaning our rooms that we use to study, we learn how to respect our surroundings. I think this is great and it has really worked out even for grown-ups because two years ago, when we went to the World Cup for soccer, our cleaning behavior had became popular. Do you remember what Japanese supporters did? We were in Brazil and cheered up the Japanese team. After the game, we started cleaning up and picked up our trash by ourselves. It’s quite common when we go to public places. Before leaving, we clean up the places. We even have a cleaning up time in our neighborhoods. We set up a specific date for cleaning up around our neighborhoods and follow it. Maybe we Japanese people are very clean people?! What do you think about this education? Being from Europe and now travelling and blogging in Japan for the first time, we realise how clean everything is. 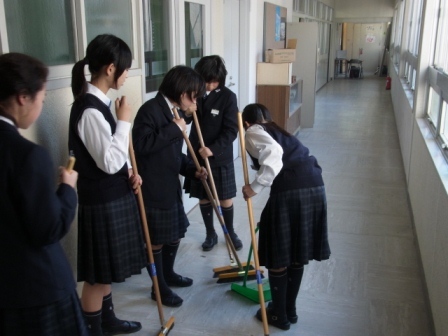 When I think of our classrooms, hallways and canteens at schools being completely trashed with dirt, sand, plastics from food etc by students who don’t care I have a lot of respect for your Japanese way of doing it! Nice to meet you. Thank you so much for stopping by my blog! I really appreciate it. Thank you for the replay again. I am flattered. I am glad that you are enjoying staying here. Where have you visited around Japan? I live in Osaka. Have you been there? I want to tell you that if you want to know my country, don’t visit major places like Tokyo. You should go to countrysides. You can see real Japan there! Enjoy staying in my country! Have a safe trip! You are very welcome. I will visit your blog later! Have fun in your lest days in Japan! I agree that the way your people handle this is much better than the way it’s done here in the USA. As you said, you learn respect for other people’s property this way. Way to go, Japan!!!!! Thank you so much for visiting my other blog! Thanks for encouraging us, lol. Thank you so much for visiting my blog before you going back to Switzerland. Have a safe trip and please say hello to Robert for me! Definitely a great way to learn to respect the environment, and other people.